Shows resource information for the selected type. Path Specifies the location of the selected resource type within the workspace. For example, similar to folders, projects map to directories in the file system. 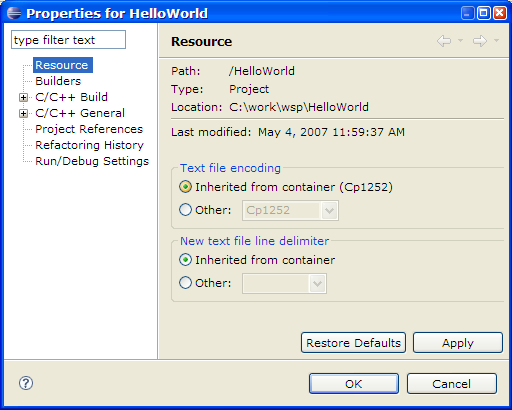 Type Indicates the type for the selected resource: Folder, Project, or File. Location Specifics the location of the selected resource within the file system. Last modified Shows the date that the selected resource was last modified. Text file encoding Sets an alternate text encoding. Because text files are encoded differently (depending on the locale and platform), use the default text file encoding for the locale of your host operating system. However, if you want to work with text files that originate from another source (for example, to work with text files that use a different encoding scheme than your native one, so that you can easily exchange files with another team), choose Other and select an appropriate one from the list. Inherited from container When enabled, the selected resource inherits the text encoding specified for it's container resource. Other When enabled, the selected resource uses an alternate text encoding other than that specified for its container resource. You can enable this option if you want to work with text files that originate from another source (ones that use a different encoding scheme than your native one), so that you can easily exchange files with others. New text file line delimiter Specifies the end of line character(s) to use for new text files being created. Inherited from container When enabled, the selected resource inherits the character line ending for new text files specified for it's container resource. Other When enabled, the selected resource uses an alternate end of line character(s) for new text files other than that specified for its container resource. For example, you can set the Text file encoding option to UTF-8, and then set the line endings character for new files to Unix, so that text files are saved in a format that is not specific to the Windows operating system, and the files can easily be shared amongst various developer systems. Available for: Any projects, folders and files regardless of project kind.